It’s June 24th, and it is FINALLY the last day of school! It is one week later than originally expected, but it seems like a month later than everyone else I know with kids in school. We really didn’t think that there were that many “snow days.” But thinking about it, Mason reminded us of all the Hurricane Sandy days, so I guess that’s what pushed us over the edge to have to add-on days. And now there are only 8 weeks left of summer. Doesn’t that seem like nothing? No matter how late it seems or how little summer is left, Mason is now a rising 2nd grader. Hard to believe. 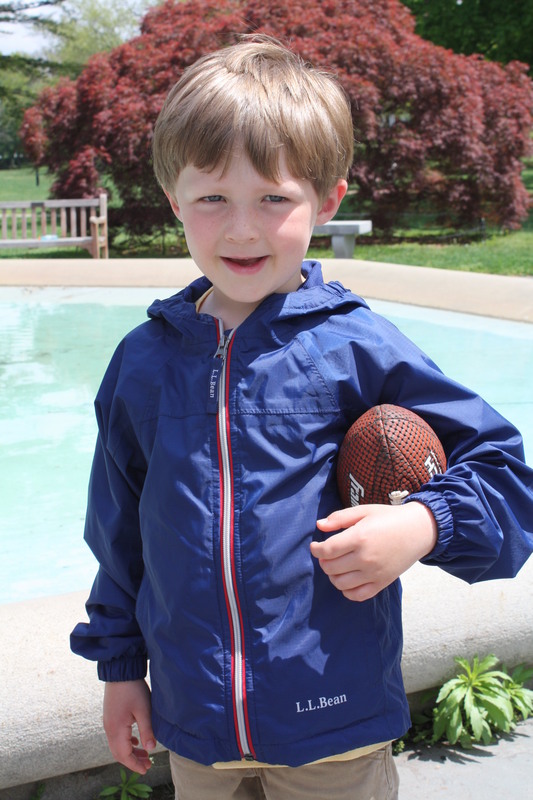 And even harder to believe is that Cooper is a rising kindergartener. Hubba-whaaa?! Let’s take a look at how much they’ve changed over the school year. 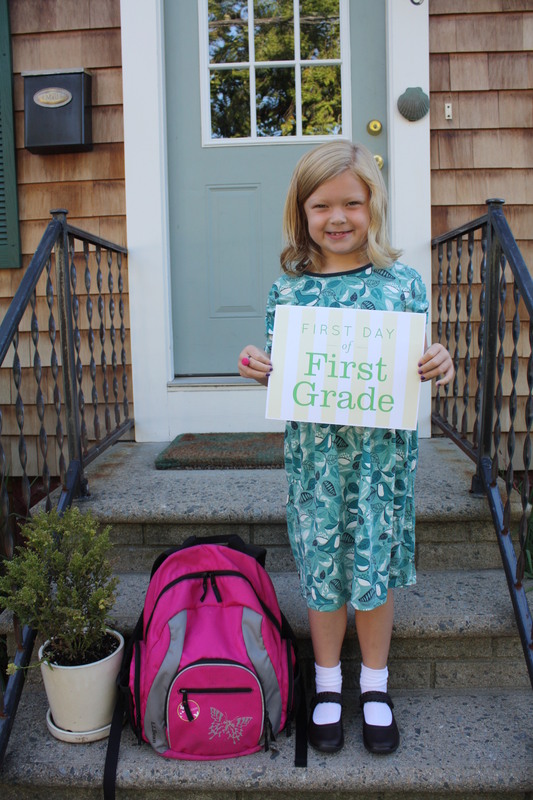 Mason on her first day of 1st grade. Mason on her last day of 1st grade. 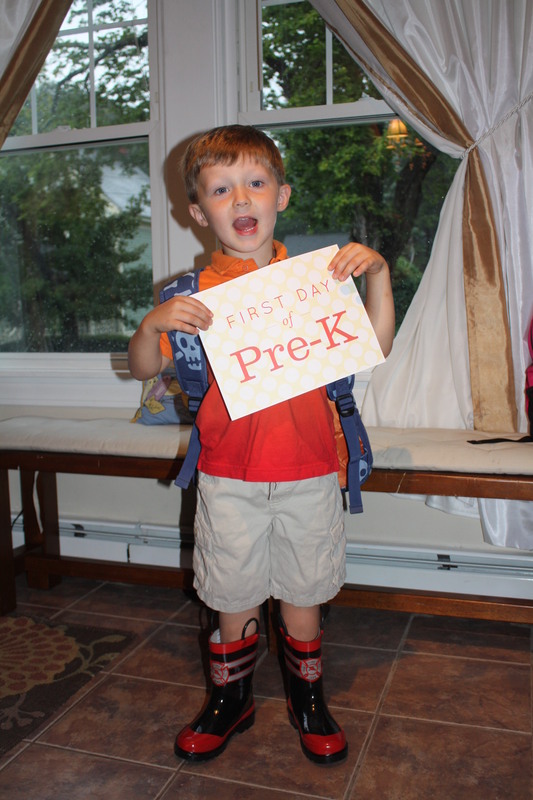 Cooper on his first day of Pre-K.
It’s been a crazy year full of settling into Rhode Island, missing friends and family down south, exploring new places, meeting new people, looking for a new house and then settling into a new house. Wow! We’ve squeezed a lot in. But of it all, I am most proud of Mason and Cooper. They have handled this transition so much better than I expected. They embraced the change (for the most part) and made the best of it. I am thankful for their teachers who were very important in their successful transition. 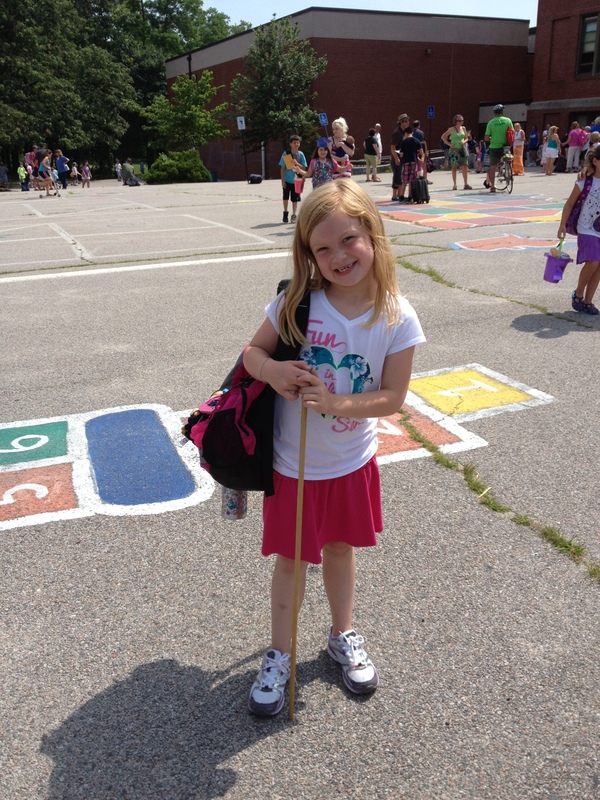 Mason was dreading the last day today because she loves her teacher so much and has made some great friends. I think she hugged her teacher about 4 times after the bell rang! She cried on the way home, and it broke my heart. Here we are forcing yet another new school and another transition. But if anyone can do it, I know she can. Cooper has the benefit of starting kindergarten where everyone is “new.” He has such a kind heart and is so eager to please that I have no doubt he will do this next transition just as well. And I’ll be the one crying next week when we have to say goodbye to his preschool teachers! But I am eager to meet new people, new families… Ones that we will be with us through middle school and high school… Ones that will help create our sense of community that we’ve been yearning for all these years. So it’s one year down, and so many more to look forward to! I was ready for a new backsplash. But sadly, Jeremy was not. Granted he was pretty busy last week and had little time to watch You Tube videos and do the research to prepare for working with tile for the first time. So I’ll cut him some slack. Instead we focused on the little things. They might not have seemed to be that big of a deal, but when you can cross several little things off your very long list, it makes a big impact. 1. 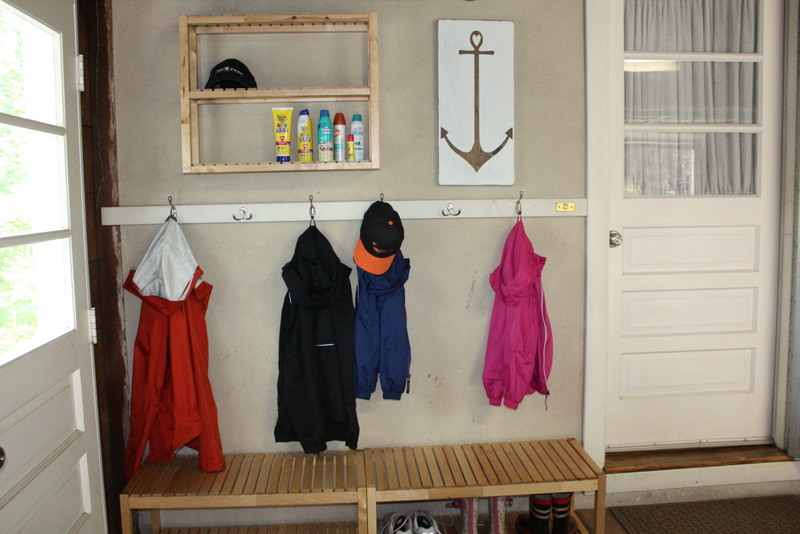 Mudroom build out: On our most recent trip to IKEA, we saw the MOLGER bench on sale and thought it would be perfect as a shoe rack and bench for the “mud wall.” (Since it’s not a real room, I feel I should keep it real with this term.) I built the first bench and then measured about three times to make sure two were actually going to fit in the space. Luckily it was a perfect fit! We bought the matching shelf to hold sunscreen, bug spray, hats, etc. And then we felt the awesome anchor wood art that my sister gave us last year would be the perfect “welcome” art to come home to every day. It all worked together perfectly. 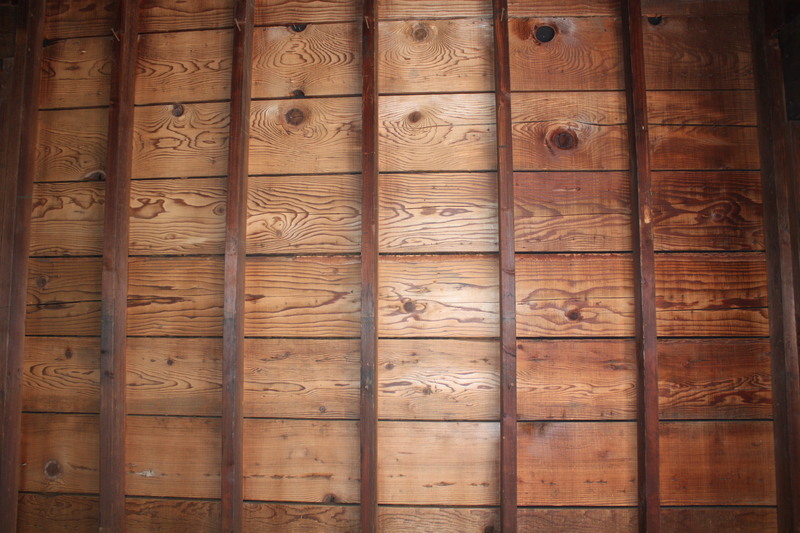 I’d eventually love to paint that wall a fun color, but for now, it is great just the way it is. 3. Powder Room Floor: Jeremy had started the kids’ bathroom floor when we had the plumber over to work on their vanity and sink. But all the edges and the linen closet still needed to be finished. Mark another one off the list! I’ll go into more detail in the powder room post with before and after pictures. 4. 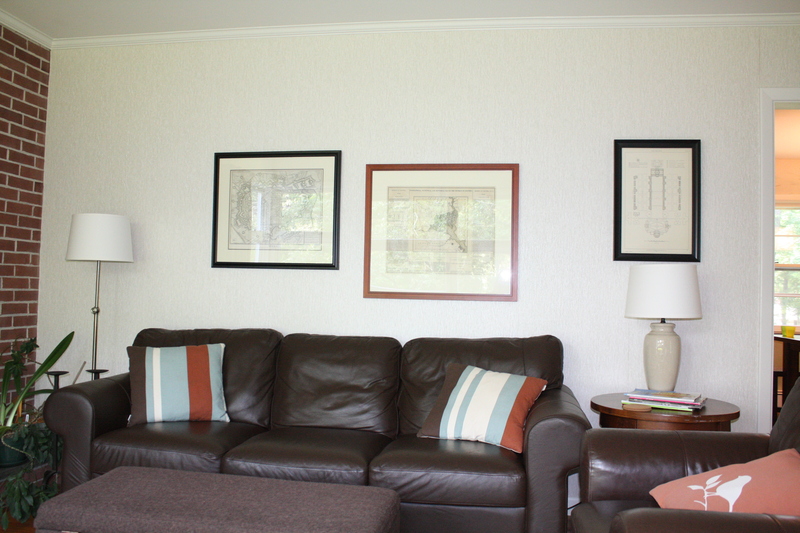 Hang Pictures: It’s amazing how hanging pictures totally transform a house into a home. 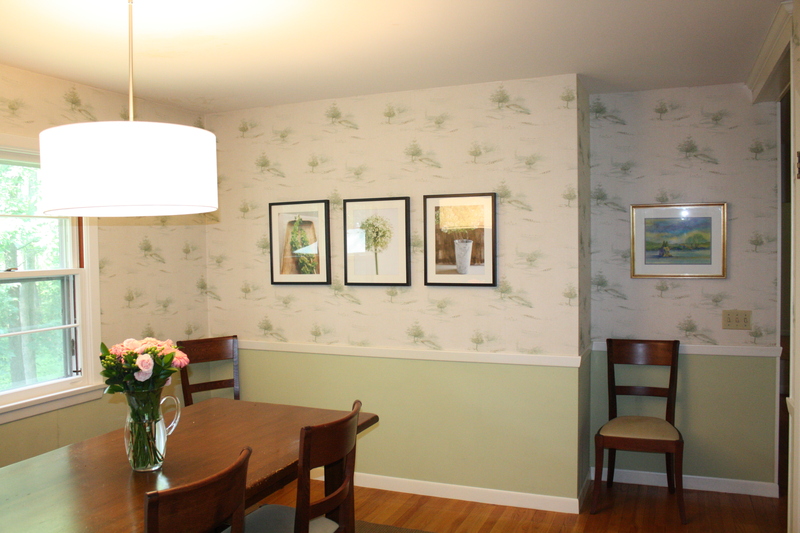 We had been thinking about putting off hanging pictures until each room was finished (wallpaper removed, primed and painted). But the realization that that was going to take a lot longer than we had originally hoped meant it was time to pull out the hammer and nails. Everything isn’t in its final place, but it’s a good start and works for now. Again, these were all small items, but to be able to take a day to get them done was just what we needed to get one step closer to putting our stamp on this house. It’s the little things, right? 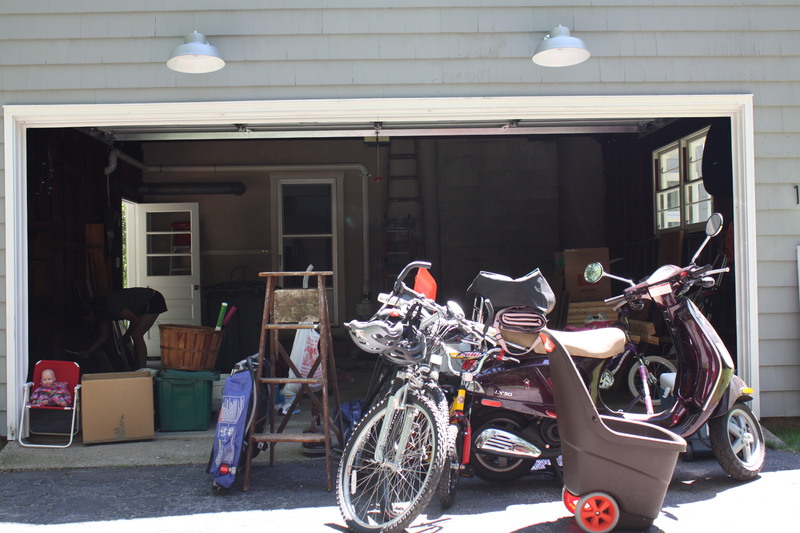 When we moved in three weeks ago, a lot of boxes and “stuff” just landed in the garage. Between the basement and the garage, we put all the boxes we didn’t need to deal with right away and all the crap thoughtful leftovers from the previous owners. 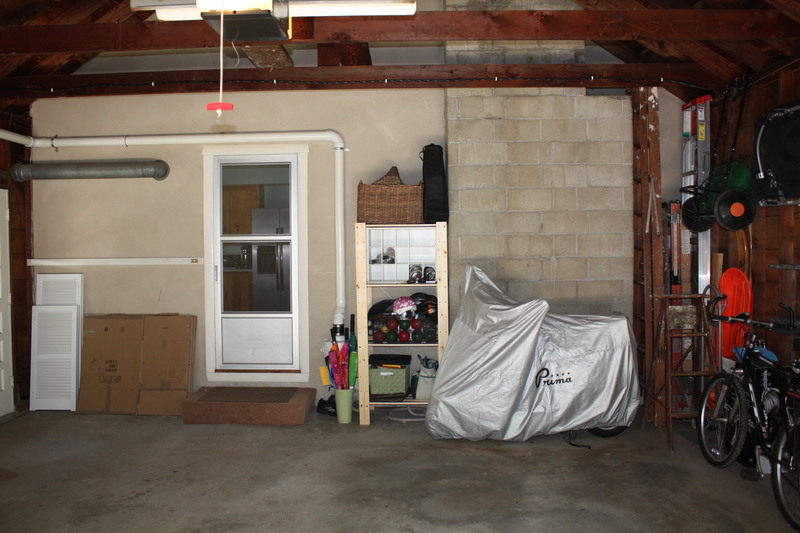 But it was getting old having a two-car garage that didn’t fit two cars and not knowing where anything really was. 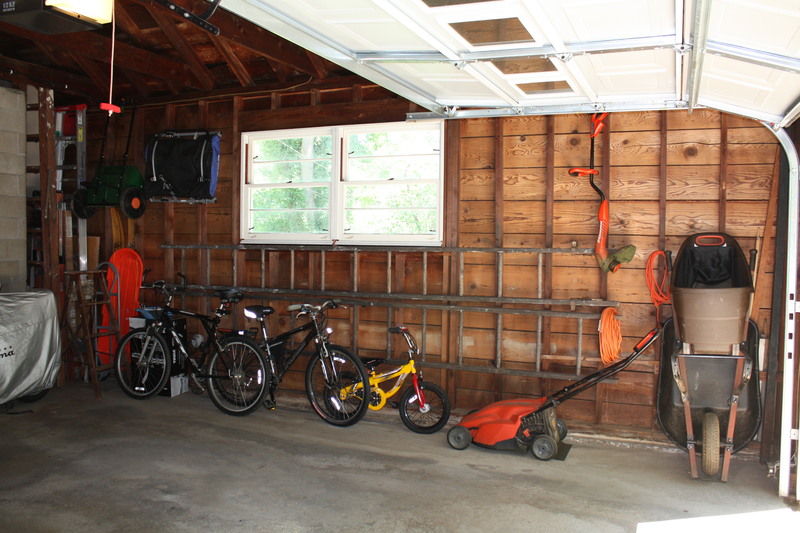 So yesterday we jumped in head first and had a goal of fitting two cars in our newly organized garage. We started by pulling everything out. Some of it was going to the dump, some of it was going to the basement and even more of it was going to stay. So how would it all fit? This was after the dump run! 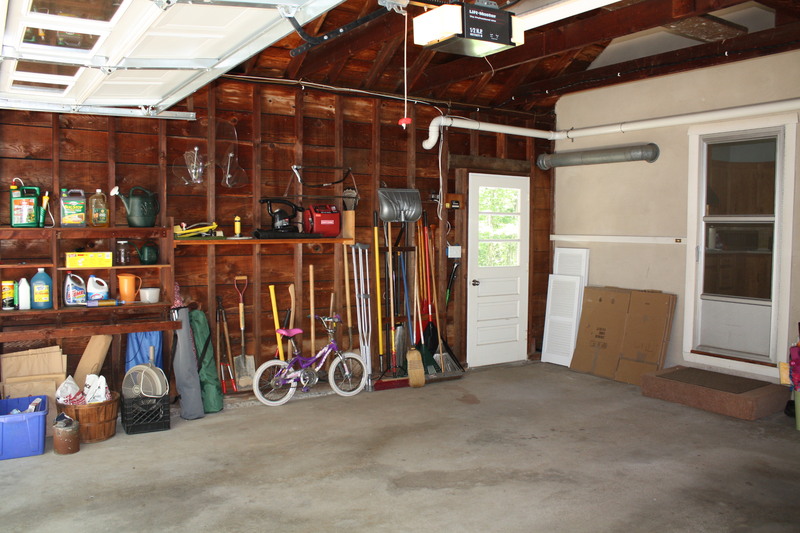 The four bays on the left have been “cleaned.” The two on the right are still to go. After a day’s worth of work, we finally started putting everything back together. Bikes are still our organization nemesis, but this will do for now. The scooter finally has a nice place to stay out of the elements. Most everything has a place. We still have plans for the garage. Eventually we’d love to spray it all with white paint, but that is a ways down the road. We’ll also paint the doors and clean up the screen door, but again, those are future projects. 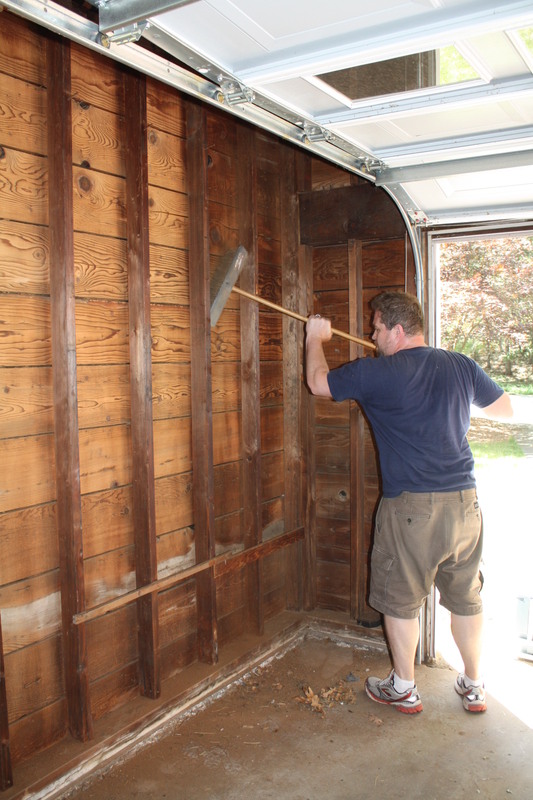 In the near future, we’ll be building out that space between the doors to create a “mudroom” area. (supplies bought at IKEA today!) And there are still items in here that will be sold at our summer yard sale. But for the most part, we’re super happy to have this clean and organized spot. Since it’s the first thing we see when we come home, it feels great to know it’s in much better shape than we found it. Next on the list? A backsplash for the kitchen! Do you remember four square? No, not the checking in app… I’m talking about the game four square. Old school four square. It was one of my favorite games as a kid. I remember getting really serious about it, and we’d make up all sorts of variations like calling out candy or boys names or colors. Being the “Queen” was the pinnacle. Oh to get to that A square! And then when I was in college as a counselor at a summer camp, four square was so popular and important that we had to ban it during certain times of the day. Oh, it’s such a fun game! Mason has started playing four square at school, so she’s asked me to chalk out more than one four square court in our driveway. Cooper’s gotten into it too, so it’s become a favorite afternoon activity. Unfortunately I’ve been super busy lately with work, so once we get back from our commute home from school (still in our old town), I’ve had to retire to the computer while they play outside or play on the iPad. It’s created a lot of stress on my end. I hate working constantly. I hate feeling tied to my cell phone every single hour of the day. I hate having to “ignore” my children when playing with them can be so much fun. Today I put my foot down. I decided to take time to focus on my kids and play a little four square. Did emails go unanswered? Yes, but sometimes that’s ok. Did phone calls go to voicemail? Yes, but who cares? Did the world end? No! I had an hour of uninterrupted time with my kids, and it was glorious. So tomorrow, when I’m overloaded with work again and the kids are asking for some attention, where will I be? I’ll be playing four square with my two favorite offspring! Since the kids’ rooms are the only completely done rooms, I don’t have any other before and after photos for you. But I thought I would share some of my new favorite things while we continue working on the kids’ bathroom and the kitchen. 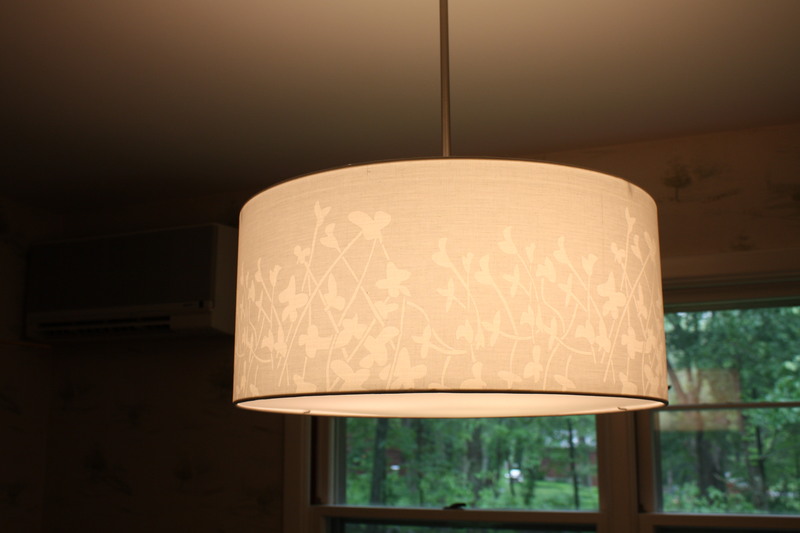 First off is our new dining room light. It’s a drum pendant, and we found it on Amazon (they have everything!) I love the subtle flowers, and I love how big it is. We decided to use LED light bulbs, and I love the white light that they emit. Every time I come up from the basement (which leads right into the dining room), I get to look at this light. And I smile every single time. It makes me happy! This is the best picture I could get to show off the flower detail. Next up is our new bedroom rug. I subscribe to Zulily and Joss & Main. They often have rugs for sale, and while I can easily find rugs I like, I get scared of ordering rugs online. You don’t get to feel them or see the real material, and those are key to a good rug. 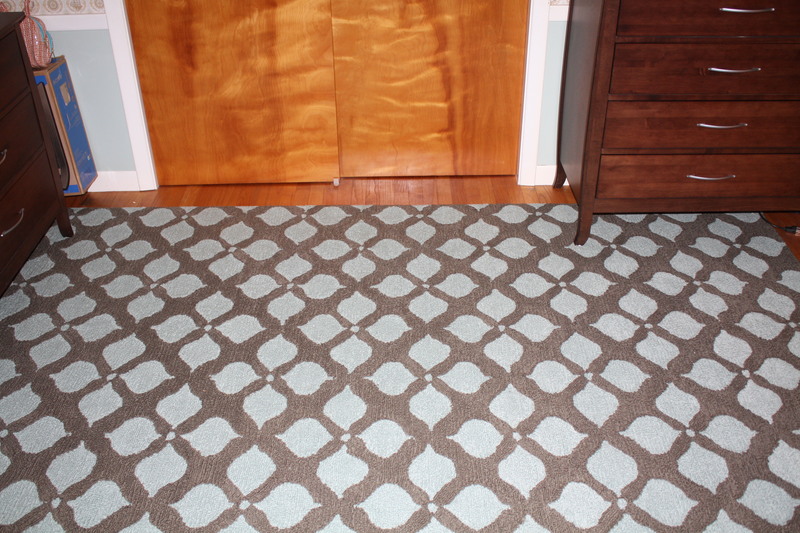 But when I saw this rug on Zulily, I had to have it. 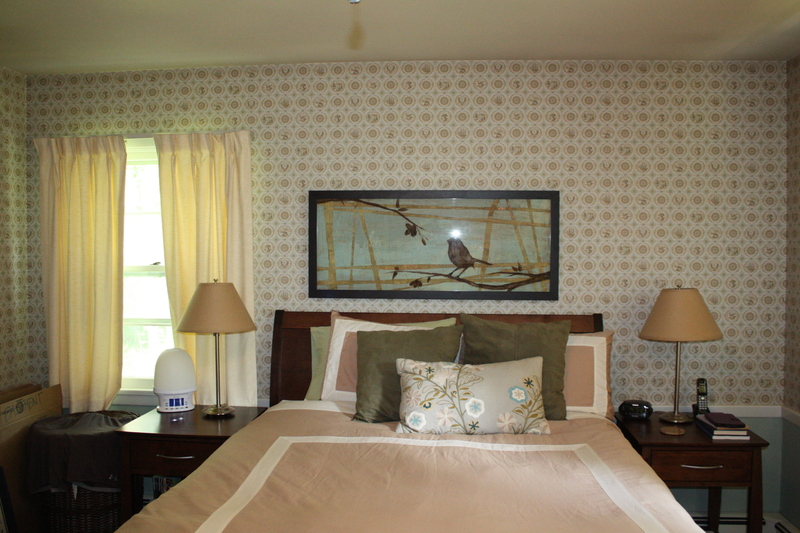 I love the blue color and knew we could base a new bedroom design out of it. It’s a great size and is so comfy on our feet. Have you seen the Martha Stewart Collection at Staples? I am a big fan and try to find any organizing or labeling excuse to buy something from the collection. Since our rental had a great white board “station,” I got used to posting our meal plan, writing to do lists and keeping notes for many other things right in a central location. 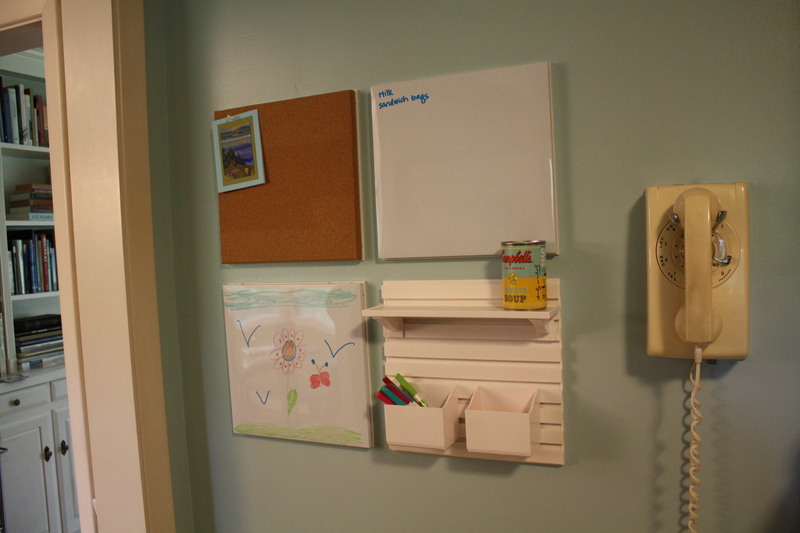 Our new kitchen had a big blank wall, and I felt it was the perfect spot for the Wall Manager system. I also bought a dry erase decal for meal planning that sticks right on the side of the fridge. I love how it all turned out. You can pick and choose each piece to make it work for you – such a great idea! Finally, my absolute favorite part of our new house… The refrigerator!!! I have never had a side-by-side fridge, and I have never had water/ice in the door. These were true luxuries to me so when we decided to get a new fridge for the kitchen, I knew that was the direction I wanted to go. We looked at many refrigerators. 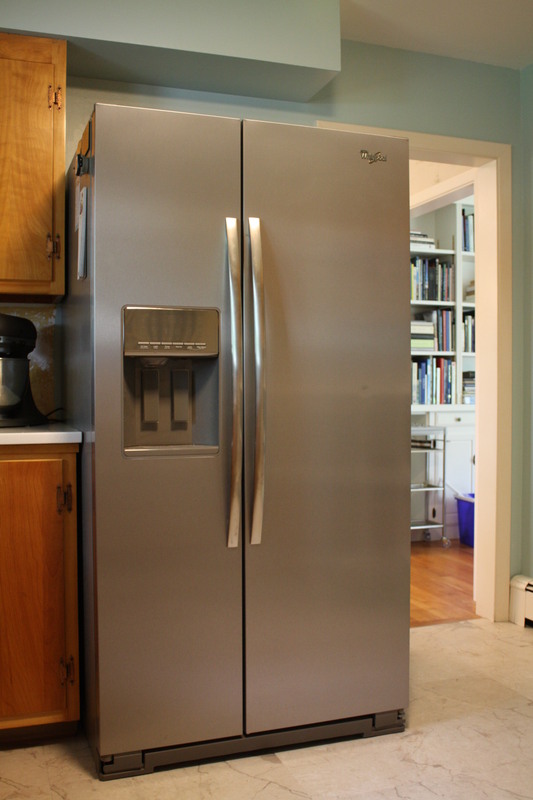 I know people love the french door system with the freezer on the bottom, but those were out of our price range. And honestly, I’m not a huge fan of the freezer drawer. I feel like so much could get lost in there, and it would be hard to organize. The side-by-side was all I could focus on. It was installed right before we moved in, but we didn’t get the water line hooked up until this past weekend. I’ve been able to get water on demand (without worrying about a close-to-empty Brita pitcher or having to wait for it to filter through) for a couple of days now, and I can easily say it is the best thing EVER!! !